Well, after a great week out at the lake visiting with family and playing with my nieces, it's time to get serious and back to healthy eating. As you can see from the photo above, the pickings at the grocery store on a Sunday night were pretty slim, but beggars can't be choosers, right? 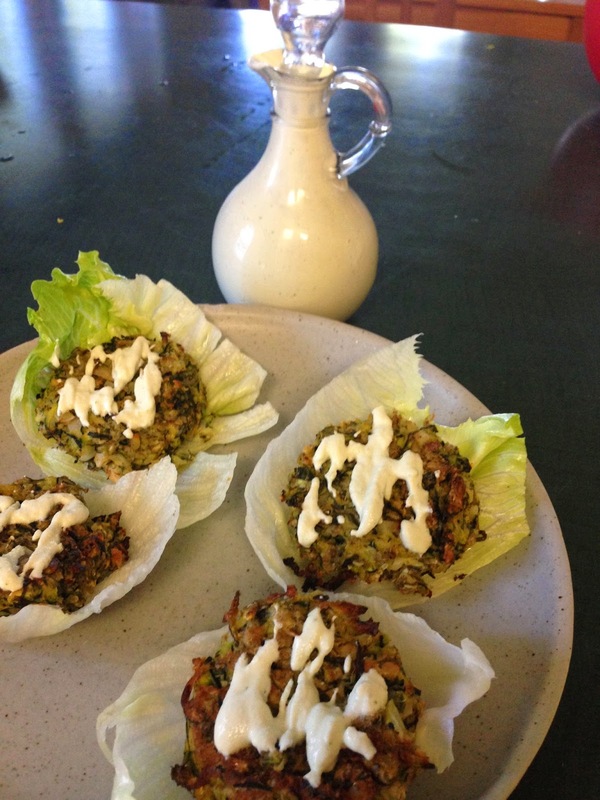 These zucchini bites are full of flavour and make a great appetizer or light meal. 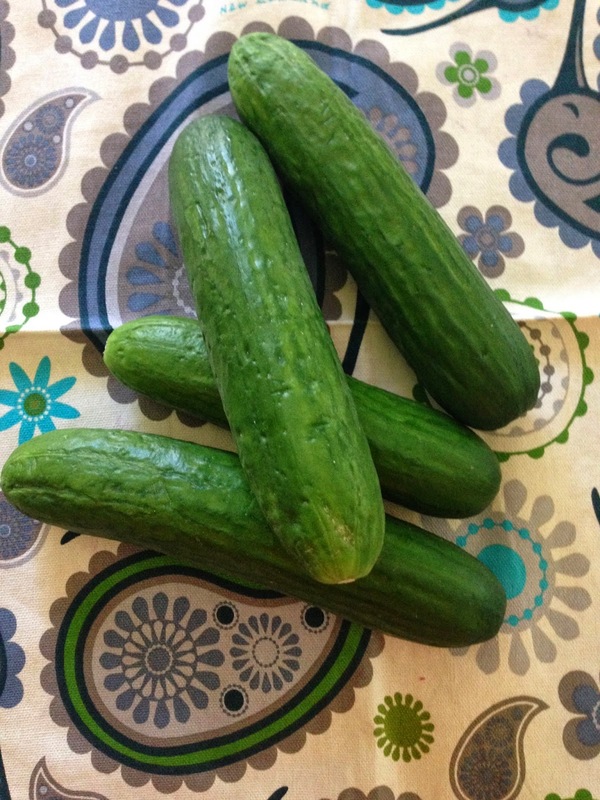 If desired, serve them in lettuce cups with raw carrot and cucumber on top. 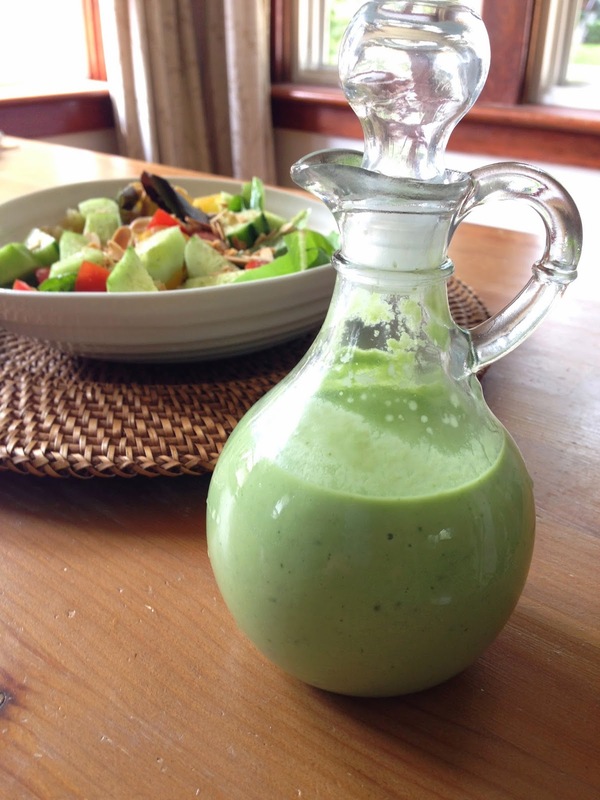 The lemon dill sauce can also be used as a salad dressing. We made these with the perogy bites and ate both for dinner. 1. 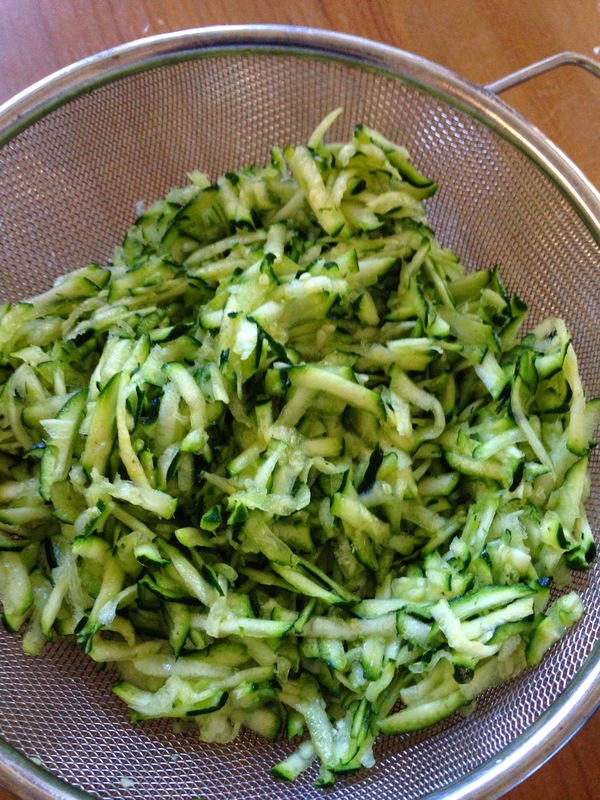 Toss the shredded zucchini in 1/2 tsp salt and let drain for about 30 minutes. 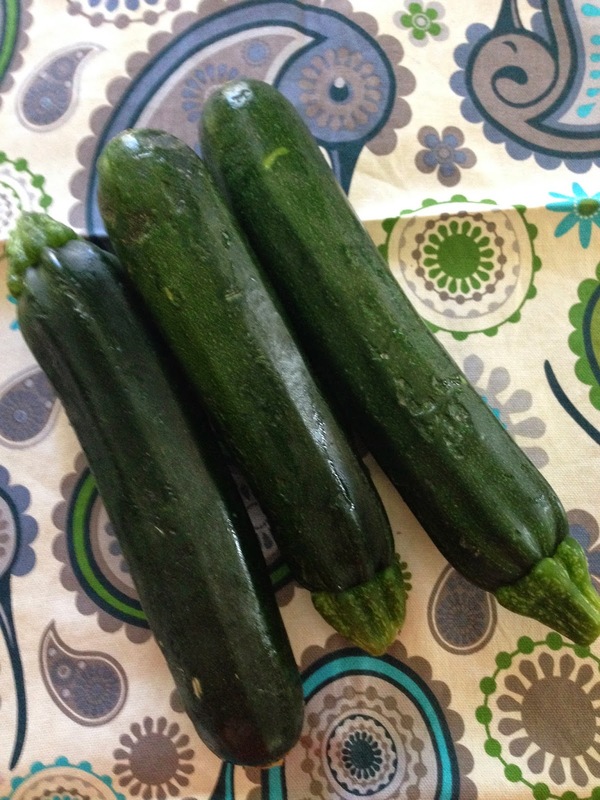 After 30 minutes, place zucchini on a couple of paper towels and wring out the excess moisture. 2. Preheat the oven to 425 degrees Fahrenheit. Coat a baking tray with a thin layer of coconut oil. Mix all the zucchini cake ingredients together. Let chill in the fridge for at least 30 minutes. 3. Using the lid of a narrow canning jar, pack the mixture into the lid to form small cakes. Slide the cakes out of the lid and onto the baking tray. Melt the remaining coconut oil and brush a thin coat on the top of each cake. You could also put a sheet of parchment paper on the baking tray, which I would do next time. 4. Bake for about 25 minutes until golden brown. 5. Meanwhile, make the Lemon Dill Sauce by combining all the ingredients together in a small bullet-type blender, adding extra water bit by bit until desired consistency is reached. 6. 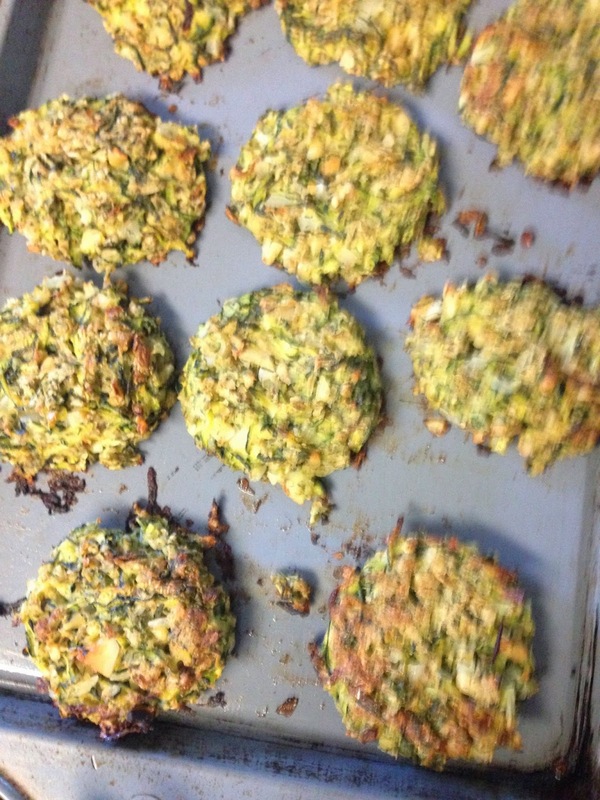 When the zucchini cakes are baked, allow them to cool for a few minutes. 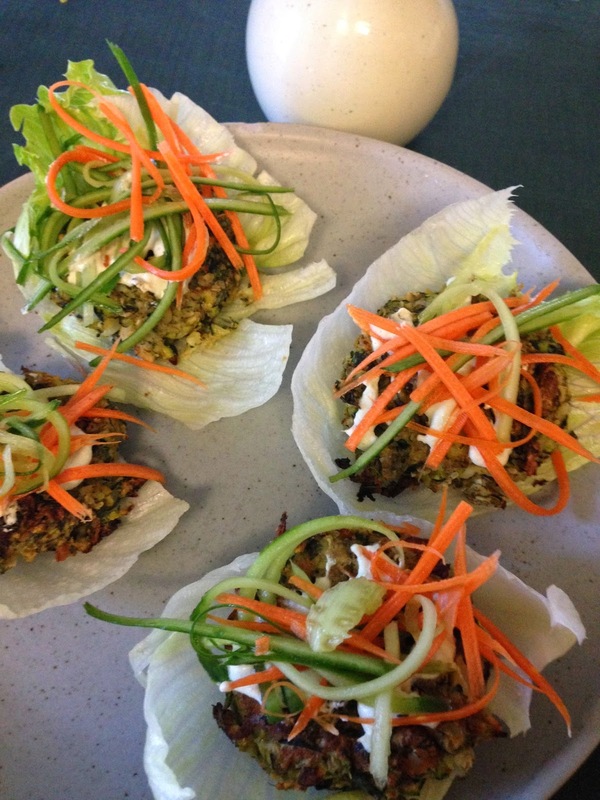 Then, serve them on top of the lettuce cups, if using. Top with the Lemon Dill Sauce, carrots, and cucumbers. Enjoy! 1. Don't go to the grocery store on Sunday night like I did! So, the final art exhibit was on Friday (although it is on display for the next two weeks), and the theme that I explored was "Our Changing Relationship with Food". No big surprise there, right? Anyway, one of the assignments was to make an artist book, which is a work of art in the form of a book. They are usually one of a kind works. 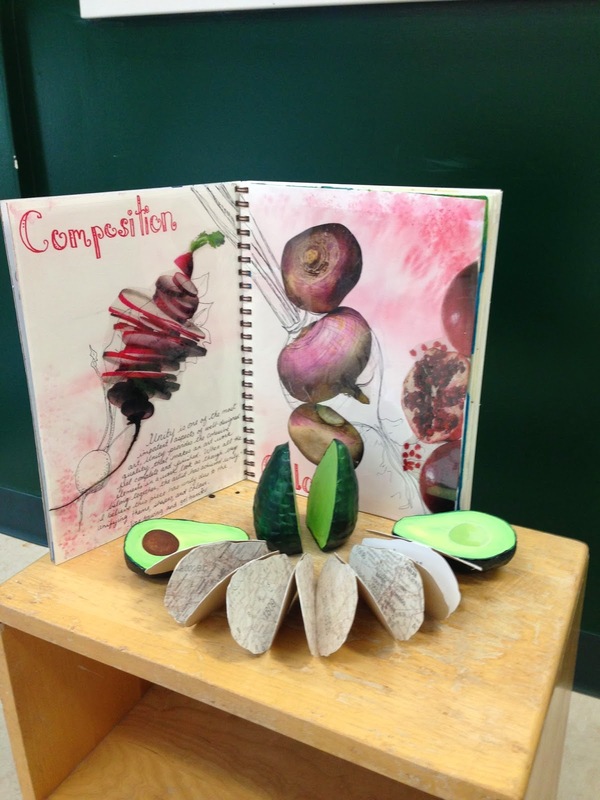 For my artist book, I made an avocado from clay and documented the history of the cultivation of avocados through altered maps. So, of course it was only natural that I was automatically nominated to bring the guacamole to the party! Luckily it turned out to be a hit since I was also named the "resident foodie" of the group. The second avocado in the picture above is my version of a seedless avocado of the future. One of the ideas I explored was real food versus fake food. 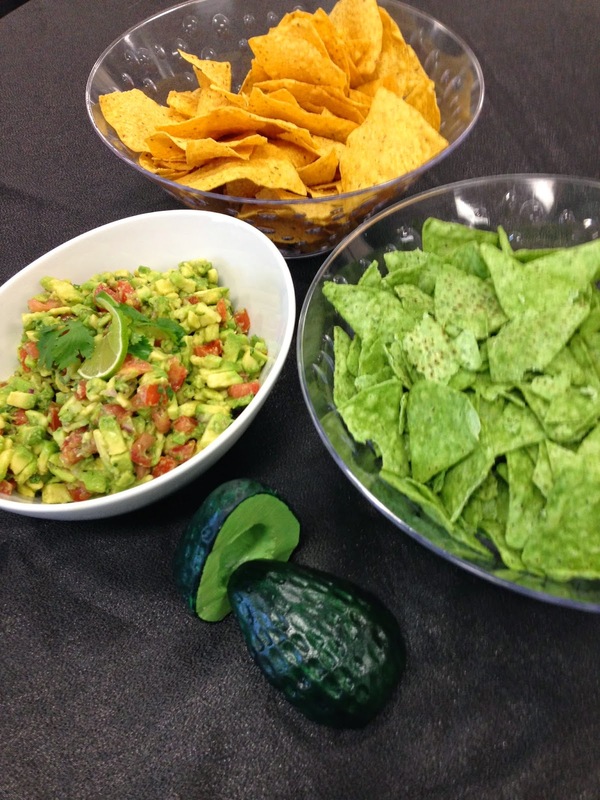 You will notice the difference between the real guacamole and the fake guacamole chips in picture below. All in all, the course was a great experience, and I met a lot of great people, but I am definitely glad to have another class completed and under my belt - only one more to go! I'm not sure how many this serves since it was all gone before I even got any, but I'd say it made about 4 cups. 2. In order to remove the seeds from the tomato, cut it into six to eight sections (depending on how big it is) and stick your thumb in the seed part (over the sink) to push them out. 3. I soak the onions in cold water to lessen the bite, but that is a personal preference of mine. 4. Be careful not to over-salt the guacamole because the tortillas that you will most likely be eating it with are also salted. Therefore, taste the guacamole on a tortilla, not by itself. Enjoy!!! 1. Ripe avocados are hard to find in the store, and if they are ripe, they are usually bruised from being poked too much. Buy your avocados two to three days before you need them, allow them to ripen on the counter, and then put them in the fridge when they are ready. Putting them in the fridge will hold them at that stage of ripeness for several days. For that reason, I always have a couple ready to go. 2. There are many strategies and myths for keeping guacamole from going brown. Because it has just oxidized, it is still safe to eat when it is brown, but it is not very appetizing. The acid in the lime does a pretty good job of keeping it green for a few hours. I have also heard from several people that placing the avocado stone in the guacamole will keep it from going brown as well. I'm not sure if that is a myth or not, but those who do it swear it works! I'm in the middle of a really intense art class for my Masters degree right now and have been creating "art" for about 14 hours a day, so this week I'm going to share with you a really easy yet delicious recipe I have slightly adapted from Angela Liddon's She Glows cookbook. This treat is perfect for hot summer nights when you are craving ice cream but don't want all the sugar. There are just a few ingredients, and they are easy to put together. If you've ever had frozen chocolate covered bananas at the fair (or Folk Fest), you will love these. You will notice in the picture that I added raw cacao nibs to mine, but I don't think it is necessary. You could try adding shredded coconut, though. 1. Cover a baking sheet with parchment paper, and place the 24 banana rounds on the paper. 2. Top each piece of banana with 1/2 tsp of nut butter. Place one whole roasted almond into the nut butter, on top of the banana round. 3. Cover with plastic wrap and place in the freezer for at least 30 minutes. 4. In a small saucepan over a very low heat, melt the coconut oil and chocolate together. 5. 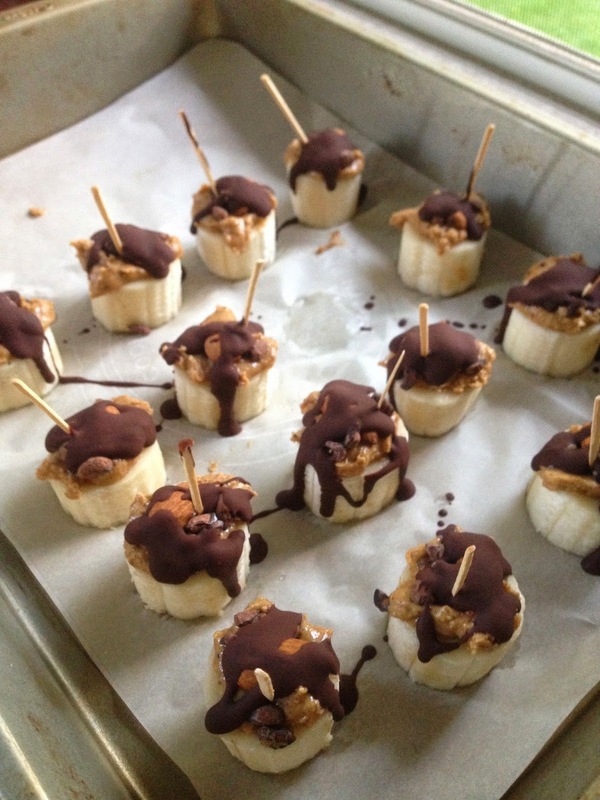 Using a teaspoon, drizzle the melted chocolate over the frozen banana-almond pieces. 6. If you want, stick a toothpick (unflavoured!) into each piece. Cover with plastic wrap again, and place back in the freezer for 15 - 30 minutes to firm up. Once the pieces are frozen, you can either eat them or transfer them to a freezer bag to store for longer. If you store them longer, partially thaw them at room temperature for a few minutes before eating them. Enjoy! 1. Many different kinds of nut butter can be found in the natural foods section of any major grocery store. 2. You can buy roasted almonds, or bake them at 350 degrees Fahrenheit for 5 - 7 minutes to make your own. I think I've mentioned before that salads are not one of my favourite meals. I always feel like they are too light and leave me with an uncomfortable feeling in my stomach if I just eat a bunch of raw vegetables. However, in the summer when everything is fresh and the weather is hot, I don't always like to cook, and salads are a great, quick meal. I've found that if I include ingredients with substance (like gains, beans, nuts, etc.) and add a hearty homemade dressing, salads can be a satisfying meal that do not leave me with gut rot. This dressing will make 3 - 4 large salads. 1. Blend all ingredients in a bullet-type blender or small food processor until creamy and combined. If needed, add a bit of water to make the dressing thinner. I served this dressing on a salad of baby romaine lettuce, cucumber, cocktail tomatoes, cooked and cooled quinoa, hemp hearts, basil, and toasted almonds. Enjoy! 1. Buy avocados at least two days before you need them. 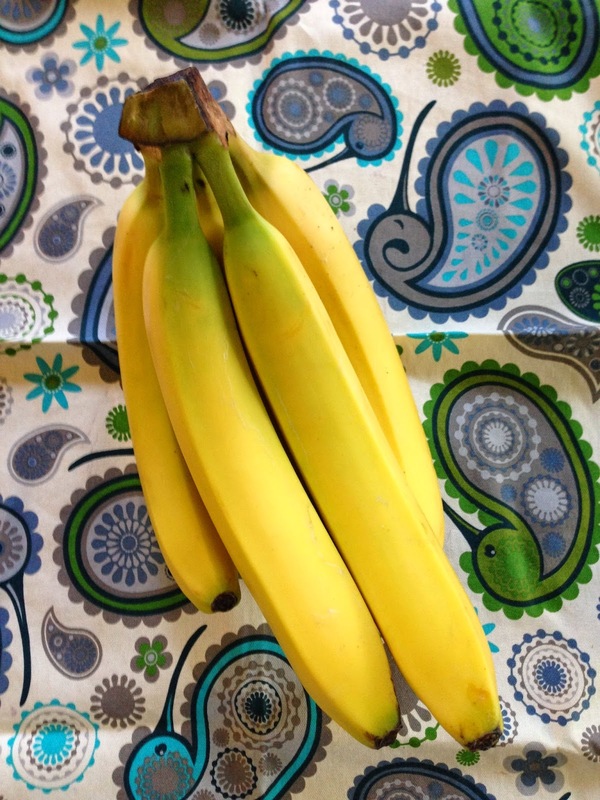 Let them ripen on the counter until they are a bit soft, and then put them in the fridge until you need them. 2. This dressing will keep in the fridge for about 3 days.